7 Responses to Homeopathy is the death of the patient suffering from gangrene. I remember reading a case report of a patient with a gangrenous toe supposedly treated successfully with homeopathy. The toe was due for amputation but homeopathy was used instead. After a couple of weeks the toe fell off and the stump eventually healed. An amputation had been avoided! What a success! Gunpowder to blow your limb off and marigolds for the gravesite, perhaps? I just want to know who was the first to try this. There is a difference between true gangrene (caused by clostridial organisms and which is almost inevitably fatal as a result of bacterial toxins overwhelming the body’s various systems) and ischaemic necrosis where following trauma, disease, frostbite etc… an extremity or other portion of tissue loses its blood supply and dies. 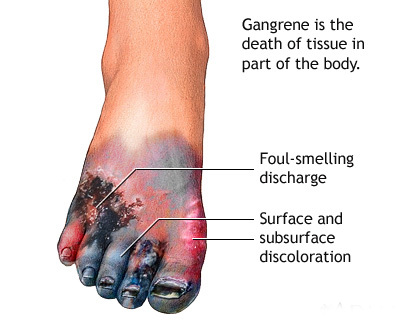 Although the two look very similar to the untrained eye, straightforward ischaemic necrosis is by no means the death sentence that true gangrene is. In the veterinary world, for one reason or another, we occasionally see examples of ischaemic necrosis which have been left untreated and they have often sorted themselves out as the affected portion of tissue sloughs, and then granulates to heal by scarring or in extreme cases simply drops off. It’s not ideal but it does happen. So I would imagine if a human were similarly affected and you could persuade the patient to do nothing or use a placebo such as homeopathy then the final result would be spontaneous resolution in many cases. Not magic, not because of homeopathy but just ‘nature taking its course’. On the other hand of course if a practitioner mistakes true gangrene (foul smell, gas formation in the tissues, wet, bloody discharge) for simple necrosis (sometimes unfortunately called ‘dry’ gangrene) and tries to treat it with a homeopathic placebo then it’s goodnight Vienna, to quote Reggie Perrin, you’ve got a dead patient on your hands and it’s time to dig out those tired old excuses about conventional medicine having ‘antidoted the remedy’. Appreciate all you wrote. Have a friend that because of low blood supply to her foot. Lacking in nutrients and oxygen to this extremity her foot is in severe pain. They did put an artery in this foot trying to help supply the blood and oxygen to this extremity. Her foot looked inflamed yesterday and her toe at the end looks like it’s turning black. She is under a Doctors care, but that seems lacking. Is there anything that you would suggest? Would something like Mega-Hydrate help this tissue? Or even something like Stabilized oxygen? Desperate for her. she needs to see a vascular surgeon asap! Silica Hydride Powder Proprietary Blend: Potassium Citrate, Silica, Potassium Carbonate, Oliec Acid, Hydrogen Negative Ions. I have no idea what hydrogen negative ions are – hydrogen ions are positive, though perhaps a chemist could tell us if there is a way to persuade a hydrogen atom to accept a second electron; perhaps they mean hydroxide ions. Both hydrogen and hydroxide ions are found in water. The other ingredients are pretty inert. The manufacturer makes some pretty implausible claims about its ability to reverse cellular dehydration and that it contains the strongest antioxidant that exists, along with monoatomic minerals, which are also nonsense. When I first became a consultant oncologist treating prostate cancer I had a patient who was taking what he called liquid oxygen drops and swore by them. I believe that stabilized oxygen is another name for the same thing, and as far as I can tell it is a dilute solution of hydrogen peroxide packaged up and sold in small bottles for an outrageous price. The thing that surprised me most was that the patient was a retired research chemist who really ought to have known better. Since then I have realised that the more intelligent and educated somebody is, the better they are at fooling themselves, because they can readily come up with plausible-sounding (to them) explanations (which psychologists call rationalisations) as to why they are right. Coming back to your original question, of course no practitioner should give medical advice concerning somebody that they have not personally assessed, though I will stick my neck out and say that Megahydrate and Stabilized Oxygen are likely to be worse than useless and an expensive waste of money, and if trying them means a delay in getting proper treatment then this could be quite dangerous to somebody who is already very sick. Strictly speaking the severe pain may be due to the accumulation of toxic products of metabolism such as lactic acid rather than due to a lack of oxygen and nutrients per se. It is a moot point because all of these problems reflect the lack of an adequate blood supply. Edzard’s advice is the only correct one, that she needs to see a vascular surgeon urgently.